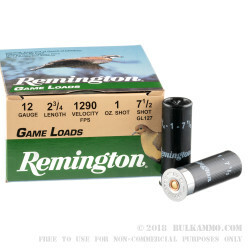 This 12 Gauge shell by Remington is loaded with one ounce of #7.5 lead shot, giving it 350 .095” pellets to work with. You’ll find that this shot size’s popularity is well-warranted. It is ideal for hunting small upland game birds including dove, grouse, pheasants, and even ducks at closer ranges, as it reliably kills them without turning your trophy into something even the dog wouldn’t touch. 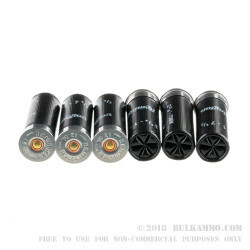 It’s also excellent for busting clays, because its range and the spacing of the pellets grant a high chance of striking even at a great range. This shell’s speedy 1,290 fps muzzle velocity helps even more to close in of fast flying clays. 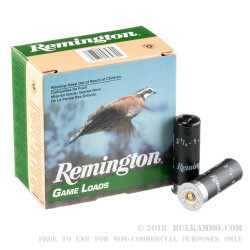 As with all of Remington’s shotshells, this shell’s reliable primer, sturdy plastic casing, and clean burning powder are a testament to the old American giant’s commitment to quality. Ever since Eliphalet Remington II built his first flintlock rifle by hand, the company has continued to innovate and surpass their customers’ expectations for their firearms and ammunition.